Just about every Asian country has its own version of hot pot. There's the original Chinese style, where diners gather around a simmering pot of broth and cook all sorts of ingredients directly at the table. In Cambodia, coconut milk is mixed into the soup base. Raw egg yolk serves as the final dipping sauce for Taiwan's version. In Malaysia, hot pot is called steamboat. And in Japan, it's known as shabu shabu. Traditionally, the broth for shabu shabu is a simple, plain broth made from kombu and water. What often makes it a fine-dining affair are the pristine cuts of top-quality meat. But in the United States, shabu shabu restaurants tend to give diners what they want — read: more flavor than seaweed-water — and offer bases like miso and chicken broth. What most sets shabu shabu apart in these cases are the dipping sauces: ponzu, a more citrusy soy sauce, and goma-dare, a sesame-based sauce. Despite hot pot's recent explosion in popularity, new entries to the East Bay dining scene have mostly specialized in Chinese and Taiwanese styles. 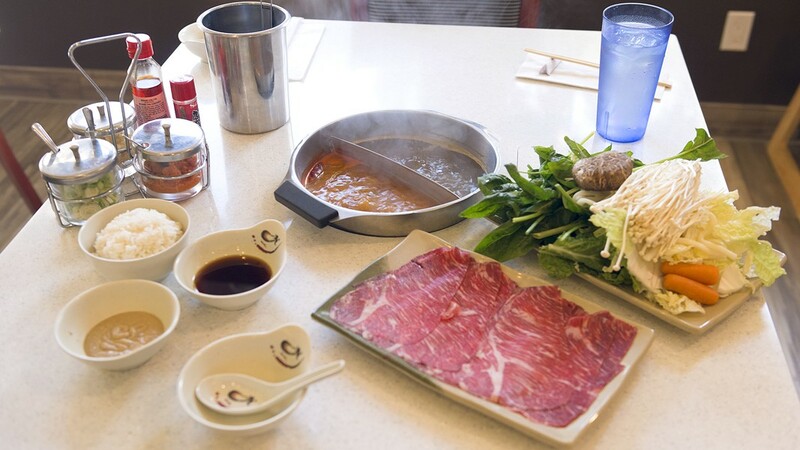 For years, the only place in the East Bay to get shabu shabu was Zabu Zabu in Berkeley. That changed when Shabu House came to San Leandro in March. The Burlingame-based mini-chain is rapidly expanding around the Bay Area, with a prime location in San Francisco's Mission district on the way. And three months later, Hancook opened, bringing the Korean version of shabu shabu to Temescal. At Shabu House, you'll get a sense of how shabu shabu is truly meant to be experienced. The immaculate space features bare white walls, gray tile, and ventilation hoods installed above every table. These tables were specifically designed for shabu shabu, with induction burners embedded within each one and a covert rectangle of removable tile to access heat controllers. They're also enormous, so there's enough space no matter how many platters of food you order. You can order all-you-can-eat, all-you-can-eat-and-drink (no premium sake included, though), or à la carte. One entrée-sized serving of meat — plus vegetables, noodles, rice, and a scoop of green tea ice cream — was plenty of food for me. Shabu House offers the traditional kombu soup base as well as spicy miso and ginger chicken options. They were all subtle, bordering on bland, but the "spicy" miso packed the most flavor. Where Shabu House shines is its flawless cuts of wagyu beef, lamb, and kurobuta pork — each beautifully marbled, radiantly hued, and fanned out with precision. As expected, the wagyu impressed the most, but all three meats were sliced paper thin, cooked in mere seconds, and achieved that desired melt-in-your-mouth quality. Shabu House staff slice the meat to order, which shows a seriousness to the craft but also can slow down orders on busy nights. Given the blandness of the soups, the sauces delivered most of the flavor — and, luckily, they were delicious. The creamy sesame-based sauce tasted almost mustardy in its sharpness, while the ponzu delivered a bright and clean finish. I also appreciated the minced garlic and scallions on each table to spruce things up. But, ultimately, I preferred the shabu shabu at Hancook for its deeply flavored soup bases. The spicy soup arrived a brilliant shade of red and gurgled with gochugaru — halfway through the meal, it turned completely opaque. The chicken version, heavily perfumed with garlic, achieved a similar richness in color. While a Hancook shabu shabu meal doesn't end with free ice cream as it does at Shabu House, it begins with a few solid banchan selections. The protein options here are also far more extensive, with a lot of seafood, which can be tough to find at hot pot restaurants. The heads-on shrimp tasted fresh, as did the pleasingly chewy baby octopus, and you can also order clams, fish fillets, squid, and mussels. But shabu shabu does tend to be all about the meat, and Hancook offers a lot of options in that department, too. The vividly crimson rib eye steak was sliced so thin that pieces cooked almost instantly. The brisket, while naturally tougher, arrived super-thin and marbled. The pork belly soaked up flavor and melted in its fattiness. And the shaved slices of pork neck offered a surprisingly gamey intensity. After a quick dunk in the broth, each item tasted multidimensional, and the trio of sauces on offer — chili sauce, ponzu, and a salty goma-dare that almost tasted like peanut butter — deepened the flavor. With the very reasonable all-you-can-eat pricing at Hancook, it's hard to not overdo it on the meat and seafood, but try to save room for the final flourish. After servers take your empty trays away, they'll either make a rice porridge or cook noodles with one of your soups. I went with the latter, and it was easily the highlight of the meal: The server dropped a bundle of floury, handmade noodles into the brownish-red spicy broth, and out came chewy noodles coated in a viscous sauce full of the flavors of everything you just ate. I often wish I could relive meals right after I finish them, and this is about as close as it gets to actually doing so.